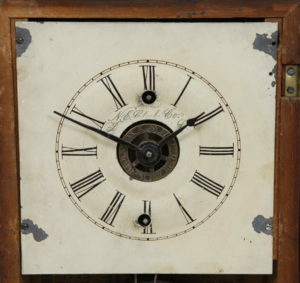 Rare miniature Connecticut shelf clock made by the New England Clock Company from Bristol, Connecticut circa early 1850’s Overall the dimensions are 11 X 7 X 2 71/2 inches and the case is constructed of White Pine and the visible facings executed in the finest grain Mahogany veneer. 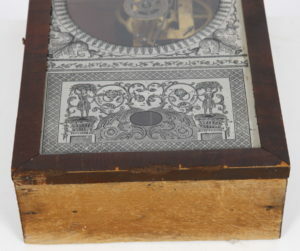 The case is structurally sound and overall in very nice condition with a lovely patina. 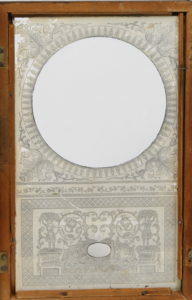 The original glass is decorated from the back with a wonderful stencil with white paint. 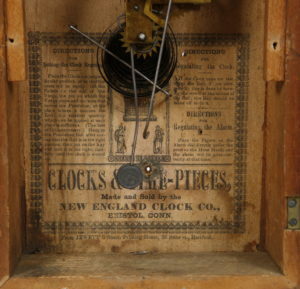 This is original to this clock and there are some minor chips/losses but NO touch up, inpainting from the back. 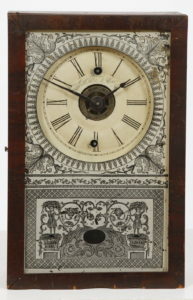 The door opens to allow one access to the clock. There is an original latch on the left side of the case that allows the door to swing open from left to right on a pair of brass hinges. 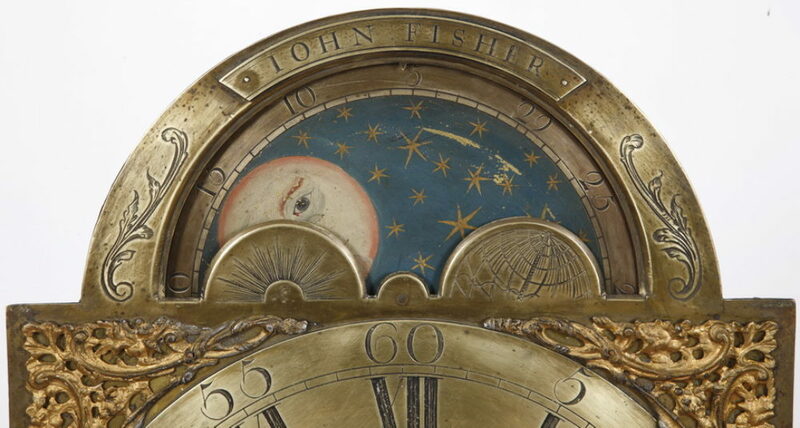 The 6 X 6 inch dial is painted on tin and has the noted minor paint loss and chipping to the original paint. 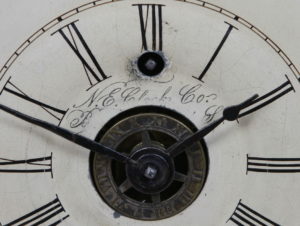 The 4 inch time track is lined with 3/4 inch Roman numerals for each hour numerals and are extremely well done and delicately formed. Note the unusual location for the winding arbor. The brass movement is a spring powered, key wound and designed to run 30 hours on a full wind. 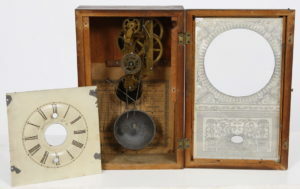 This configuration has the added complication of an Alarm. The brass ring in center sets the Alarm. 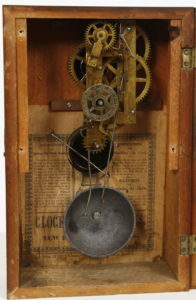 The Alarm is powered by a separate spring located at the bottom left corner of the movement and it winds at 6 o’clock.